Arsenal manager Arsene Wenger says Tottenham will be under increased pressure to deliver on the pitch if they move to a new stadium. Spurs plan to redevelop their current White Hart Lane ground to accommodate a new 56,250-capacity venue. North London rivals Arsenal moved to a new £400m stadium themselves in 2006. "If you look at English clubs who have built a new stadium and look at where they have finished, then it tells you how difficult it is," said Wenger. The Gunners have only recently begun to reap the benefits of the switch to the self-funded 60,000-capacity Emirates from Highbury, after years of having to set aside significant funds against a long-term fixed interest rate repayment bond. During that time, Wenger was required to deliver Champions League football while also balancing the books. "I knew always that would be the most sensitive period in the history of the club," he said. "When we were in a position where we had to be in the Champions League just financially and you get into March/April and are like that (not in top four), the stress is terrible because you feel the future of the club is at stake and you have not a lot of margin (for error) - every point you lose can be dramatic." Tottenham say they are continuing "discussions with multiple providers of finance" in search of "the optimum financing package for the project". Recently, American investment company Cain Hoy has said it is no longer considering making an offer for the club. 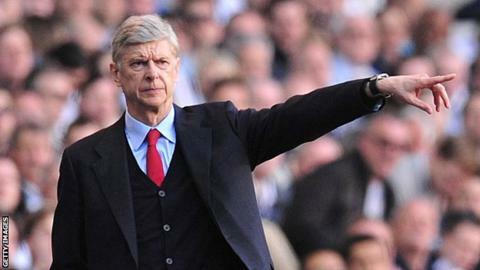 Wenger believes they will need an external cash injection to complete their stadium plans. "If an owner comes in, and says 'look I put £400m to buy the stadium' it is easy," added the Frenchman. "The way we did it is the hardest way, because we had no outside financial help and had to negotiate with the banks just to get the money at the start - and lets not forget we paid £120m just for the land. "In the end we built the stadium for £400m, today it would cost £600m or up to £700m."